Chorizo!!! I first fell in love with chorizo when I was 5 years old. (Well, that's the first memory I have of eating chorizo.) But the fondest of my chorizo memories is of my grandmother and her sister-in-law, my dear aunt Jessie, making their own chorizo. Gramm and Tia Jessie would get together a couple times of year for the sole purpose of making their homemade chorizo. I loved to watch them work their magic in the kitchen. Tia Jessie would mix everything together with her hands, while Gramm added the spices and vinegar. Oh, how I wish I had paid more attention to the process. I would LOVE to try my hand at making my own chorizo. Hmmmm! Now that I mention it, making my own chorizo sounds like a good project for after the holidays. When I was younger, Gramm used her chorizo in 3 dishes; chorizo con huevo (chorizo with eggs), chorizo con papas (chorizo with potatoes) and chorizo con frijoles (chorizo with beans). It wasn't until I got married that I discovered the endless culinary possibilities of chorizo. I could even write a book...101 ways with Chorizo. But I'll just continue to share my recipes here on the blog. 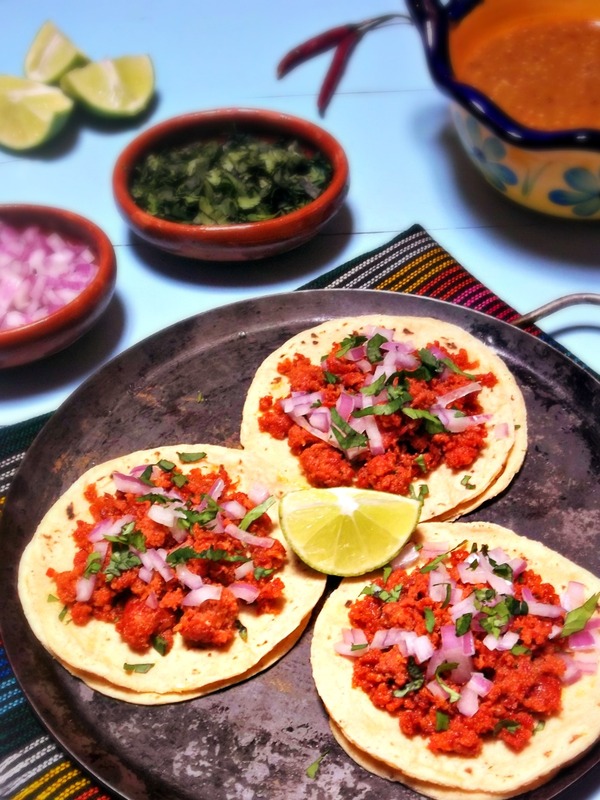 The first recipe is for Tacos de Chorizo. I discovered these super delicious tacos when we first moved to Mexico. I couldn't believe my eyes when I saw Tacos de Chorizo printed on the menu at our favorite taquería. It was like I had died and gone to Chorizo lover's heaven! I've loved them ever since. 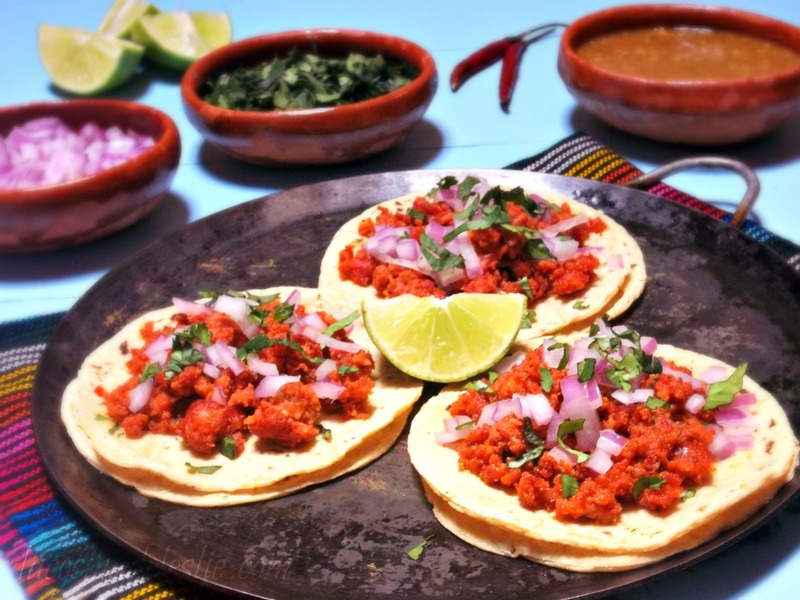 Like most tacos, Tacos de Chorizo can be eaten at anytime of day; breakfast, lunch or dinner. Yes, even for breakfast! Tacos de Chorizo for breakfast are always a hit at our house. Remove casing from chorizo, if necessary. Brown the chorizo in a medium skillet over high heat, until completely cooked. For each taco, stack two corn tortillas. Serve desired amout of chorizo in the center of the tortillas. Top with cooked beans (optional), chopped onion and/or cilantro. Serve with your favorite salsa. Enjoy!!! *Canned beans can be used. And now for Frijoles con Chorizo. 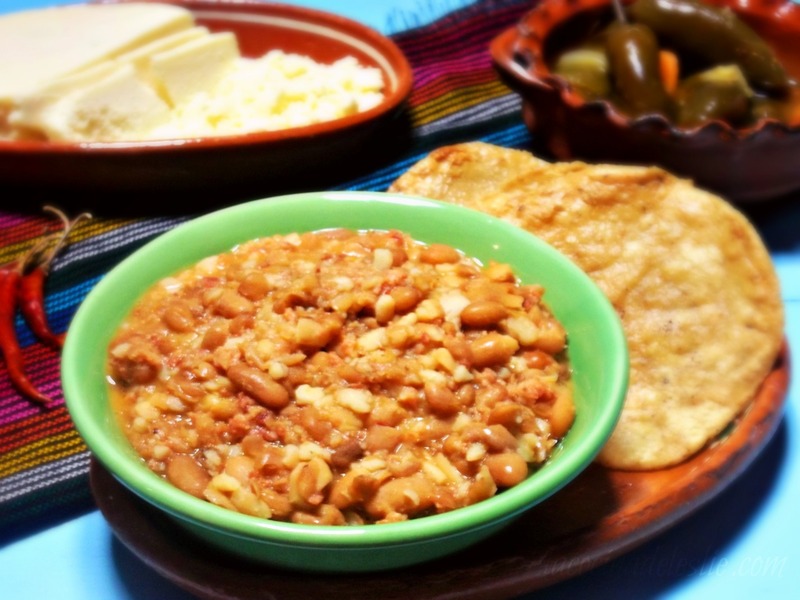 This is one of those tried and true basic recipes that is a staple in every Mexican kitchen. Spicy and fragrant Frijoles con Chorizo are more than just a side dish. They can be served as a filling for tacos, gorditas, and/or burritos. Frijoles con Chorizo wrapped in a flour tortilla makes one quick and tasty breakfast burrito. But my favorite way to eat Frijoles con Chorizo is served atop cruncy homemade tostada shells and topped with Queso Fresco. 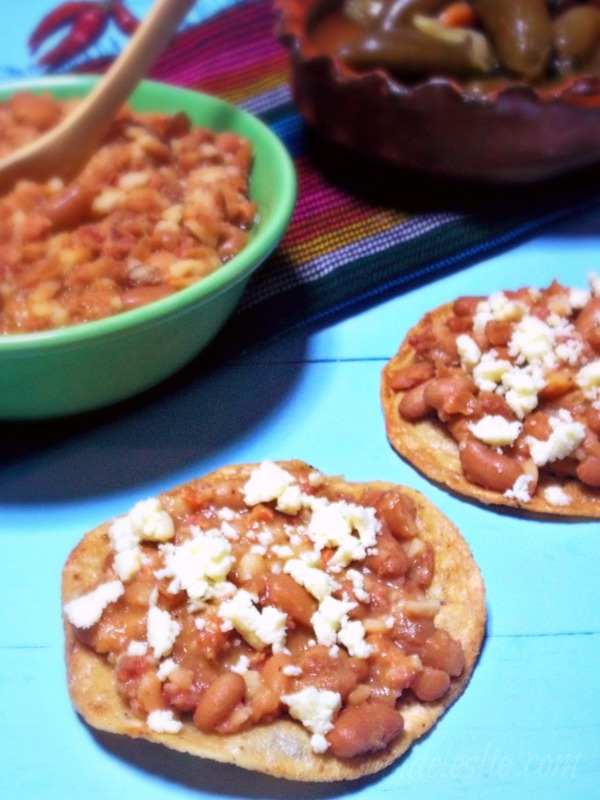 Tostadas de Frijoles con Chorizo are great to serve as a game-day snack when watching football or futbol! Remove the outer casing from chorizo, if necessary. Brown the chorizo in a non-stick skillet until completely cooked. Add the cooked beans with about 2 cups of bean broth. Cover and let cook until the beans start to boil. Serve as a side dish, or spoon a couple tablespoons of Frijoles con Chorizo onto tostada shells. Top with Queso Fresco, Pico de Gallo, or your favorite salsa. I love mine with a splash of canned jalapeño vinagre. Enjoy!!! What's your favorite way to eat chorizo? Answer below in the comments! MMMMMMmmmm Hallelujah on the Chorizo! I'm already on the ban-wagon with this one but I wanted to chime in and say how RIGHT you are to love it and I hope everyone tries it!! Leslie, can you explain the difference between chorizo and longanisa? I always get so confused! Its really hard to find good chorizo where I live. I don't understand why the carnicerias here can't get it right.So frustrating! I've never had chorizo with beans before. Well, maybe I have. My step mom used to make refried beans with a tad of the chorizo and the fat. Those were good! But I do LOVE chorizo and eggs tacos- mmm! hi pete!! quieres tostadas de estas? Do you have a favorite brand of Mexican chorizo (that's available nationally)?